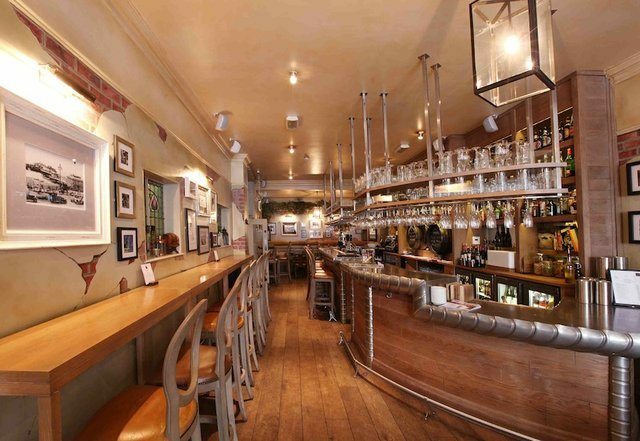 Everything a British pub should be with a ‘Hotel Du Vin twist’. Sunday’s are usually a day at home for me. With the family, eating a home-cooked roast and relaxing on the sofa afterwards. Recently however, my boyfriend and I felt we needed a change. It had been a long week and we felt like treating ourselves. 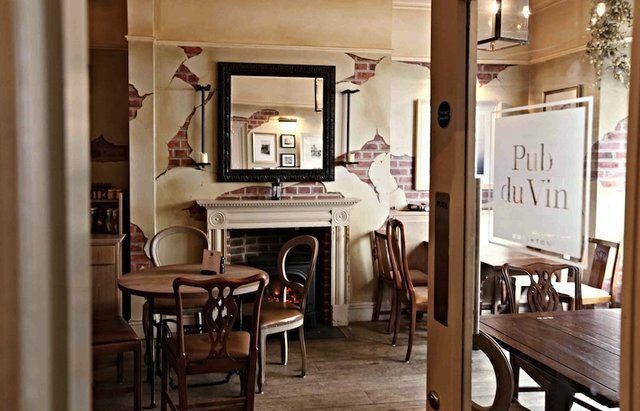 The Pub Du Vin is the neighbouring pub of the beautiful Hotel Du Vin on Ship Street. It’s everything a British pub should be but with a ‘Hotel Du Vin twist’. 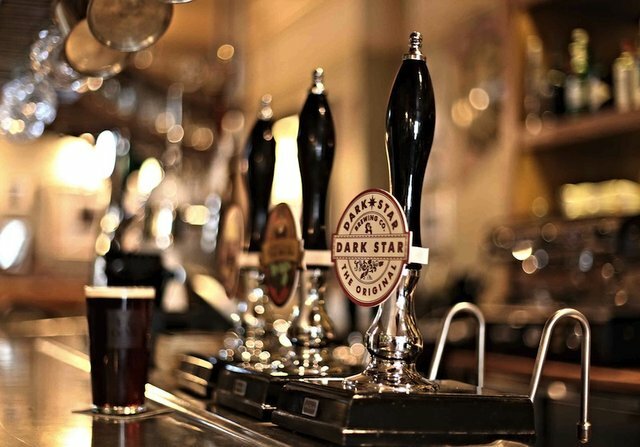 One of only 2 pubs in the Hotel Du Vin company, we are lucky to have it here in Brighton. It’s housed in the old Sussex Arts club and has been here for approximately 4 – 5 years. One might presume it’s a ‘pub of wine’ imagining more of a wine bar than a traditional British pub. This is not so. It serves local ales and proper traditional pub food, just like any proper pub should. On a Sunday, they offer a 4 course Sunday brunch. The whole affair begins with a soup course, followed by ‘a help yourself lavish French Market Table’ (this is what drew me in the most), a selection of traditional main courses and ‘a few delectable delights’ to finish. As you walk in your eye immediately goes to the impressive horseshoe shaped bar in the centre. With no separate area for diners, the tables are dotted around the bar. I liked this as it integrates the drinkers and the diners, giving a cozy, homely feel to the place. The walls are painted to look old with a faux distressed brick and plaster design. There’s lots of pictures of local Brighton scenes on the wall and homely artifacts like lanterns and letter holders dotted on the window sills. There is a gorgeous french bay window at the front of the pub which brings lots of light in. The staff are all very professionally dressed in black and white. They glide throughout the pub effortlessly and seem to work very well together. There are lots of smiles, but not those false perfunctory smiles that you often get from waiting staff but real genuine smiles telling me that they are actually enjoying themselves. 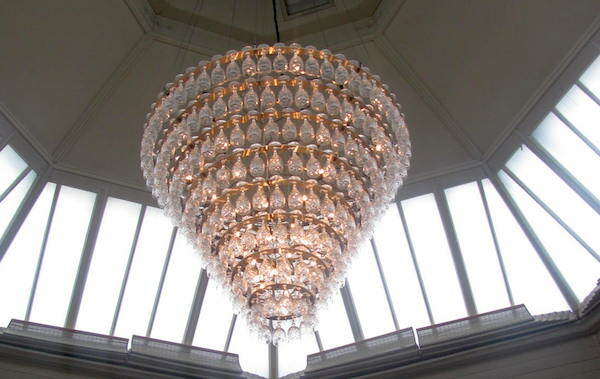 This always makes a huge difference to the atmosphere in a pub or a restaurant. Our waitress sat us promptly and told us all about the menu. She explained there would be a soup of the day to start which was potato and leek, followed by the French Market Table which was conveniently right next to us at the end of the bar. It looked amazing and was absolutely gleaming with fresh seafood, charcuterie, pates, rillettes, fresh vegetables and salads. 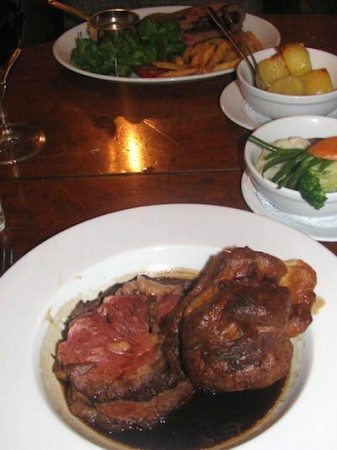 Then it was a choice of a traditional main course including the classic Sunday roast and desserts to finish. She gave us a few minutes to decide. There was a generous choice of mains to choose from including the ‘Roast Du Vin’ which was either the Rib of Aberdeenshire Beef or the Normandy Chicken. Both with all the trimmings and a proper homemade yorkshire. Other mains include Steak Frites, Poached Scottish Salmon and Spelt and Chanterelle Mushroom Risotto. 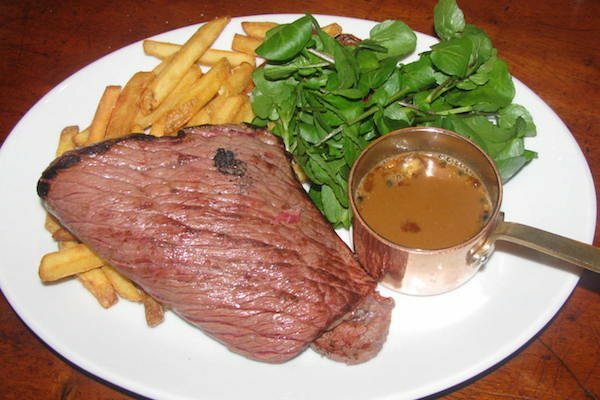 We were both feeling ‘carnivorous’ so Tommy went for the Roast Beef and I went for the Steak Frites. As you might expect there was a great list of wines to choose from also. We went for a Cote Du Rhone. It was beautiful. Smooth, rich with berries and very easy to drink. There is also a great cocktail list. They have a selection of ‘brunchy’ type cocktails including Bloody Mary and Bucks Fizz on the Sunday brunch menu, presented as another course. Why not. Shortly after ordering our mains a huge basket of warm artisan breads arrived. At this point I knew I needed to be careful. We all know how freshly baked bread can trip us up at any meal, let alone 4 courses. At least our soup arrived quite quickly so we didn’t have too long to fill up. The soup arrived steaming hot in an elegant white soup bowl. Though this was not the first thing I noticed, but the colour! It was a vibrant green. I took this to mean that it was full of goodness and perhaps had been pureed with a vegetable such as kale or spinach. Either way, the taste was absolutely fabulous. So full of flavour and as Tommy commented, although pureed you could still really taste the potatoes and the leeks. Next was the French Market Table course so no waiting required. The waitress explained what everything was and told us to help ourselves whenever we were ready. The first thing on the table was a tray of jars with a selection of olives and pickled vegetables. I love anything pickled so I went for a bit of everything. There was more fresh bread followed by a huge silver bowl filled with ice and mini crab shells. There was a selection of rillettes and pate including mackerel and goose. 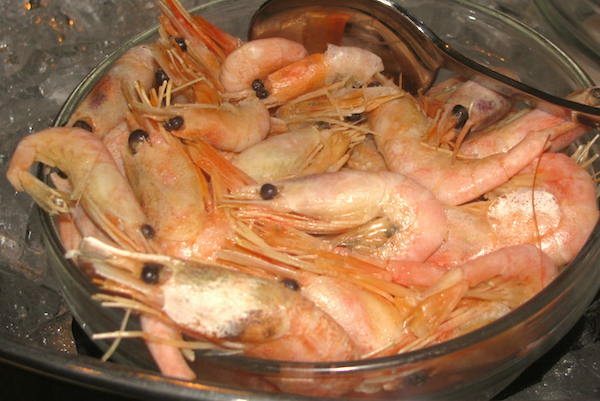 There were prawns, shrimp, oysters, salmon, trout, and a large selection of charcuterie meats. Everything tasted extremely fresh and of superb quality. It was definitely the star of the show for me. Now for the mains. Tommy’s roast was a huge piece of beef cooked lovely and pink with a giant homemade yorkshire all covered in a rich, red wine gravy. His roast potatoes and veg came out as sides. The potatoes were fluffy and the veg vibrant and crunchy. He didn’t say much throughout which I always take a good sign. My Steak Frites was an equally huge piece of rump, also cooked perfectly pink. It was served with ridiculously crunchy ‘frites’ (I think they must triple cook them), a mound of watercress, a grilled half of a tomato and a cute little pot of peppercorn sauce. Both meals were a sight for sore eyes and as with the other courses everything tasted fresh and of fantastic quality. As it says on the menu, the beef is from Aberdeen, the charcuterie is from Sussex, and the fish and seafood from the local shores of Brighton. To finish our superb Sunday Brunch we both decided to have some coffee and a small ‘delectable delight’. Tommy decided he would pass on the dessert front, but once I looked at the choices, this wasn’t something I felt able to do. Quite a classic list including profiteroles, tarte tatin and a banana rum bread and butter pudding, I did wonder how I would fit it in. As a compromise I went for a slightly lighter option called the ‘Bistro Du Vin Coupe’. This was a small cup of vanilla ice cream, pistachio ice cream, nougat and chocolate sauce. It finished things off perfectly. 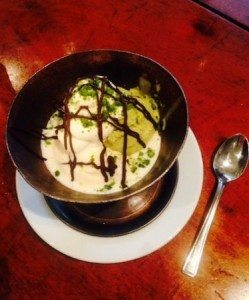 If you don’t feel like cooking on a Sunday, Sunday Brunch at the Pub Du Vin is a wonderful experience. It’s got all the attributes of a proper traditional British pub but also has the added twist of it’s sister boutique hotel next door. Definitely worth leaving your sofa for. Which is exactly where we were now heading.